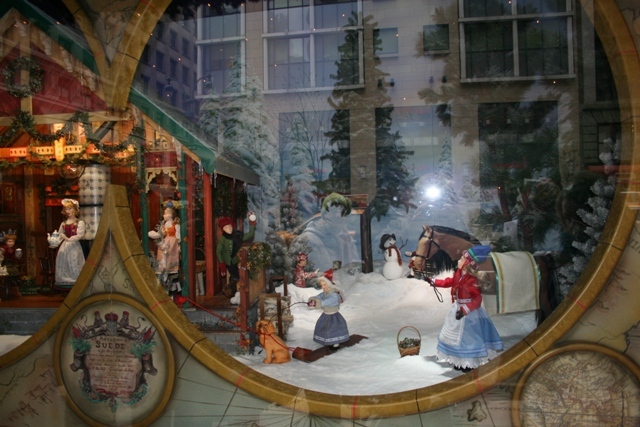 Top of my New York list was to check out the festive shop windows, a prolific New York holiday tradition and no wonder! 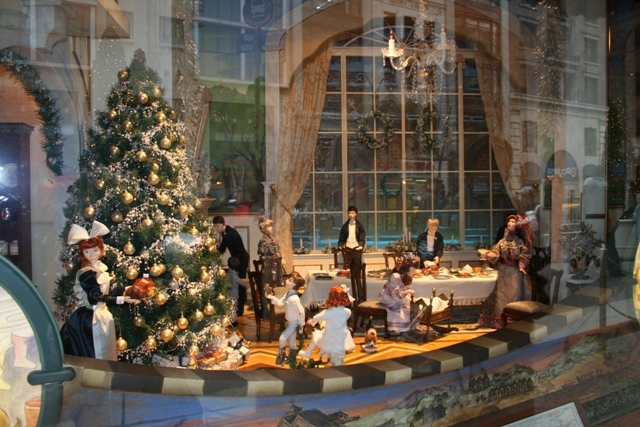 Every year designers transform the department store windows into miniature Christmas worlds attracting passers-by like us to gaze in awe. 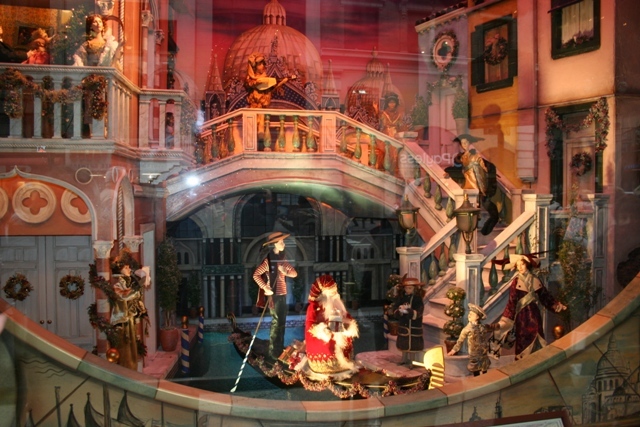 Several evenings we walked 5th Avenue from 39th to 59th Street along with gazillions of other people to check out the spectacular window scenes. The attention to detail, colours and theming are incredible. 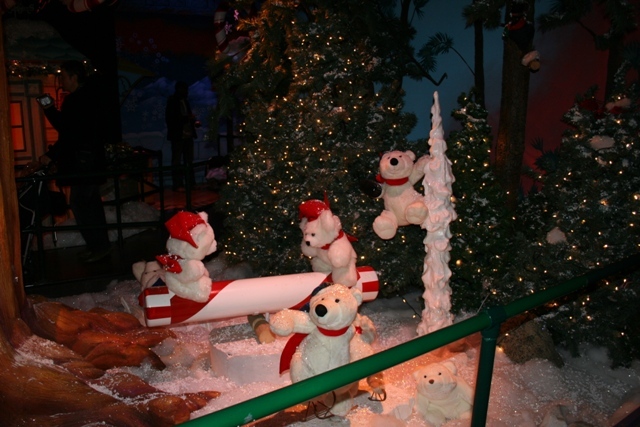 Macy’s was Son’s favourite – twinkling lights, a giant Christmas tree and on our trip several years ago the theme was a toy factory. He had to be dragged away. 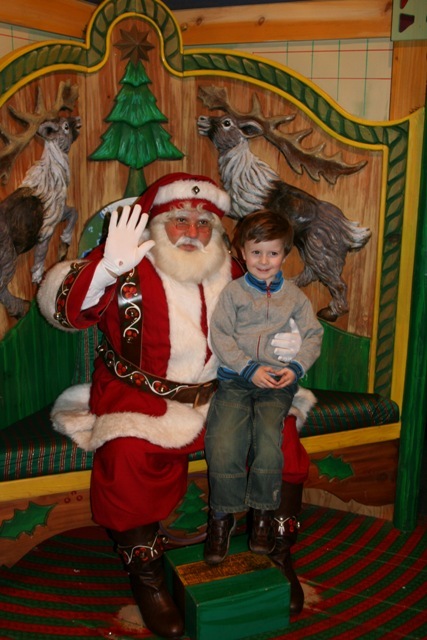 We couldn’t just look in the windows at Macy’s – a trip to Santa Land on the 8th floor was also on the must-do list. The shop was unbearably crowded at ground level but amazingly, on a Monday evening once we got past the lower floors and the horribly packed elevators we found Santa Land blissfully empty. A stroll through gorgeous wintery scenes with many reindeer and bears brought big smiles from Son – we were equally enamoured – a treat for adults and kids alike. Plenty of friendly elves en-route calling out festive greetings heightened the atmosphere and anticipation. 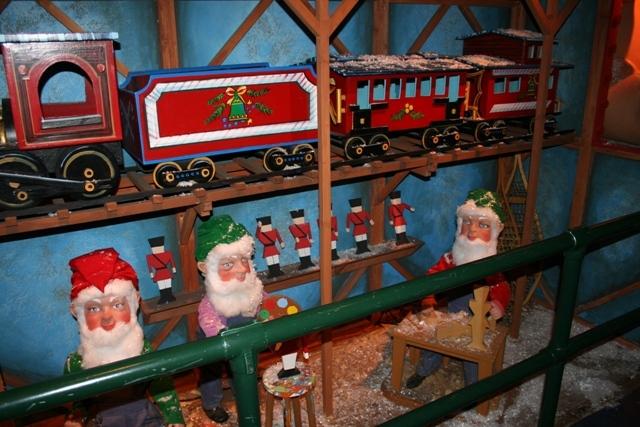 Right at the end was Santa himself – again we had no wait at all and were immediately directed into a little “cottage.” Beautiful theming and a fat, friendly and jolly Santa – Son could not wipe the smile from his face. I was super impressed with the whole experience too. We were not rushed in any way, they took a picture but encouraged us to take plenty of our own and we felt under no pressure to buy their offering. We did though! 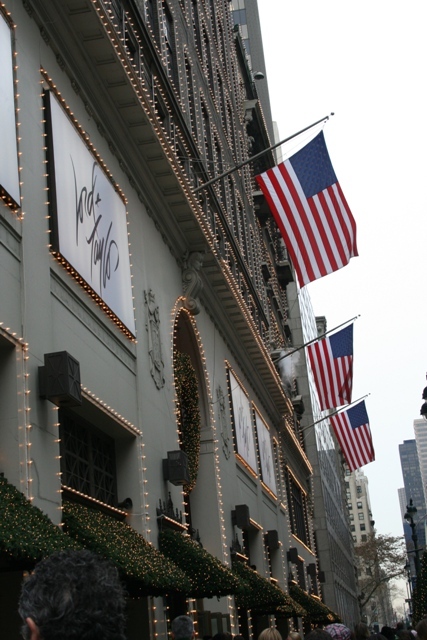 Saks 5th Avenue, Bloomingdales and Barneys had window displays to wow but up there on my top spot was Lord and Taylor on Fifth Avenue between 38th and 39th Street. We had a look at night-time then returned on a Friday morning to find we had the store front to ourselves. Extravagant scenes with animated figures all themed around Christmas in various cities around the world this was right up my street. Seven years ago I was seriously impressed and can only imagine what delights they must have created this year. It wasn’t all about looking in the windows, some shopping had to be done but with a four year old in tow toy shops tended to take priority. 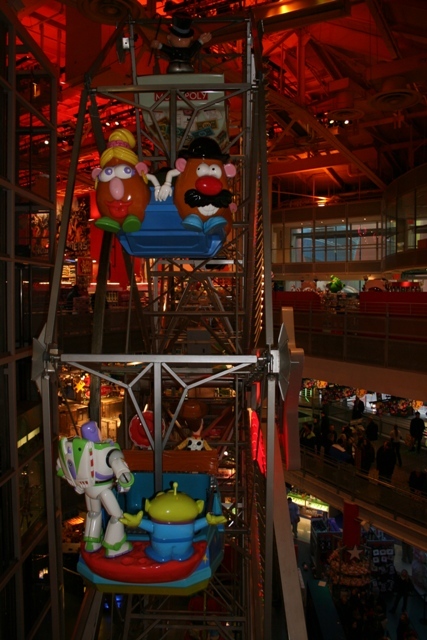 Toys-R-Us was our first port of call in Times Square. I have to say this establishment is no favourite of mine at home, I avoid it as much as possible, but the Times Square version was just a bit different. We found three floors with every toy under the sun, were amazed by the Lego models and loved the 60 foot Ferris wheel right in the centre. Every cab has a different theme, it wasn’t cheap to ride but we did it. Fifteen minutes later when we got off Son was still massively excited – a fairground ride through the middle of a toy shop – hard to beat. 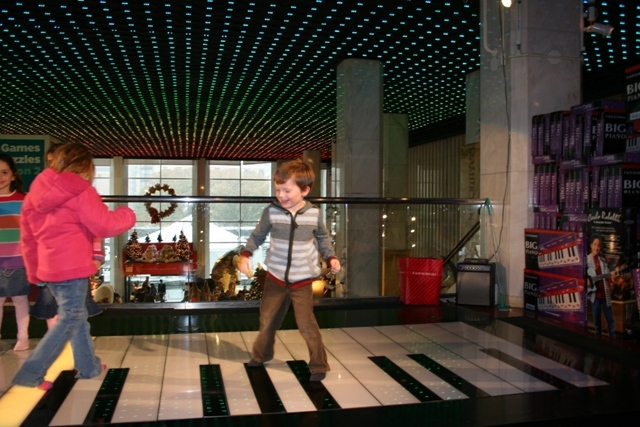 Award for best NYC toy shop though must go to FAO Schwarz – just visiting this place is an experience. We loved this shop so much we came twice – once on an empty and blissful Wednesday afternoon, once on an unbearably packed Saturday morning – choose your time carefully. Three floors of toys to wow children of all ages, we fell in love with the vast collection of furry animals and discovered nothing compares to toy shopping here. The experience starts at the door – we were greeted by a man dressed as a toy soldier who was friendly and happy to pose for pictures. 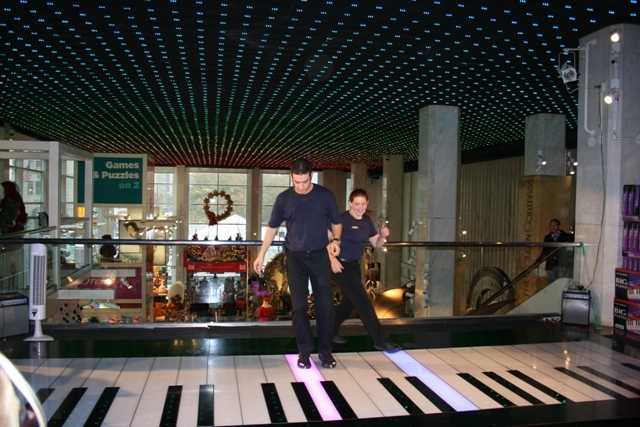 My highlight was the giant floor piano on the first floor – who can forget Tom Hanks dancing on this in the movie Big? Every fifteen minutes two members of staff dance and play tunes on the piano – fabulous. In between they allow children (and adults) free rein – also a lot of fun. Those shop windows all aglow and those NYC toy shops did not disappoint – quite the contrary I think they spoiled us for evermore. Nothing quite compares…. We’ve had similar Santa moments like that – think this might have been one of the first successful visits!! I can understand where they’re coming from though – a strange man in a red suit with a huge white beard must be more than a little scarey!! It was sooo cold Rosemary – we really felt those bitter temperatures but it is a good excuse to get into those shops!! I can hardly imagine how cold it must have felt Joy! I thought it was freezing in Yorkshire on our last trip over this April when it only reached 7 degrees maximum one day which is not too bad in the great scheme of things! I think I would have to purchase a snow suit to visit New York in the winter! And I would definitely take refuge in the shops!! 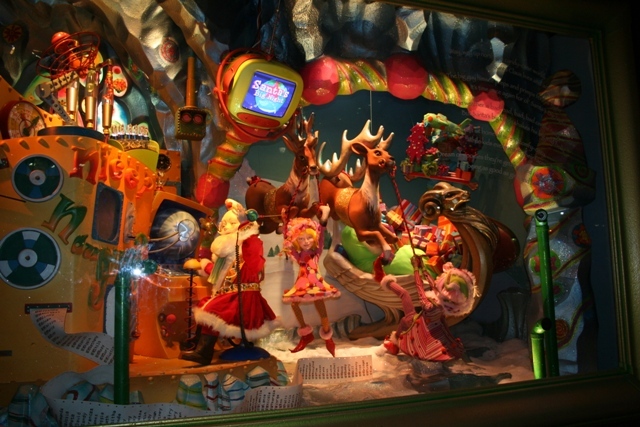 I would love to see all the window displays at Christmas. Maybe next year we will go up for a day trip or overnight. It looks like your son had a magical time. 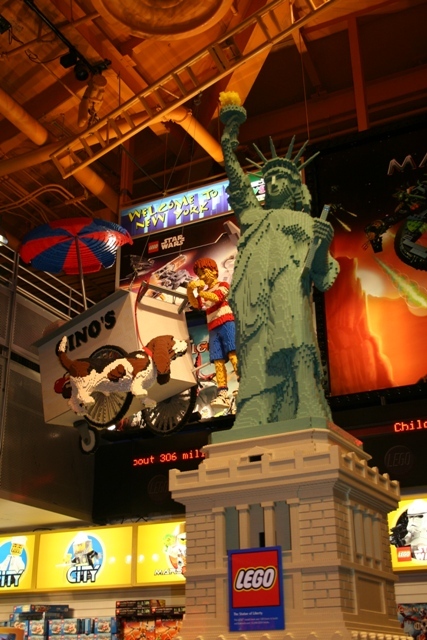 My kids loved the Times Square Toys R Us too. Thanks for sharing your experience and photos. I never usually like Toys R Us but here it was great. The window displays are amazing – I could have spent my whole time just looking in them, never seen anything quite this good before. Think your kids would really enjoy it all too. I have no words… so at least it’s clear Christmas time in N.Y. will be exciting for the whole family! Absolutely – age doesn’t matter, it’s just magical. I loved the toy shops just as much as the little people!! Thank you – we had such a great time it was fun writing a post about it all! Absolutely – they are incredible and nothing I have seen anywhere else compares! Great series of images about one of the classic traditions in NYC. Good to hear that FAO Schwarz is still impressive. I loved that scene in “Big.” Thanks for a great post. 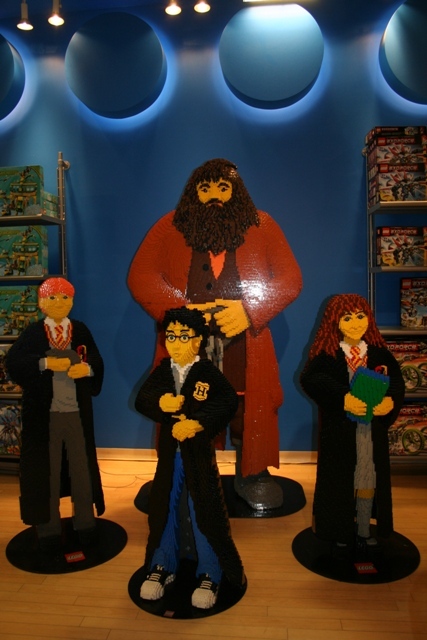 We were so excited to be having our own “Big” moment – it is such an incredible toy shop, the whole experience was unforgettable. Great post and terrific photos! Thank you! It was a fantastic trip. Thanks Kamila – it was wonderful, such an amazing trip. Merry Christmas to you too – enjoy the festive season! How were the crowds in those toy stores? Were the New Yorkers nice to you? BTW best wishes for a happy birthday! The toy stores were not at all crowded when we visited during the week, a last minute Saturday morning trip before we left was a totally different story though – unbearable! So I think we were lucky and picked our times just right. The New Yorkers were lovely – polite and friendly without exception – were we lucky here too?? Thanks for the birthday wishes!! There are not many things as magical as Christmastime in NYC! The lights, the displays, all of the Christmas trees around the city, really make it such a special place. I totally agree Patti – it was such a wonderful trip, we all had the best time and I would love to visit again at this time of year. It is fantastic – the shops are amazing!! What great pictures! So many fabulous window displays. We especially love the gondola with Santa. Thank you!! Those windows are incredible, so much attention to detail and amazing to just peek in. So amazing ! I would love to see NYC during the holidays! Lovely pictures! It is a wonderful city at any time of year but during the holidays it is just magical – I really recommend!! beautiful! love the city… even during the cold. headed back in a couple weeks! lovely photos captured, new fan. Thank you! I love NYC – one of my favourites. What fabulous windows. I think that New York does a better job than Paris and those windows (Galerie Lafayette and Le Printemps) are wonderful. They were magnificent Judy – definitely some of the best I’ve ever seen – although I’ve never been to Paris at Christmas time (would love to though!!). The first time I went to New York, my mother took me at Christmas, and NYC has been my favorite at that time of year ever since. It’s so magical. This year, a friend and I went very early on a Saturday morning and kept departing places (including the delightful FAO Schwartz) just as the crowds were arriving. 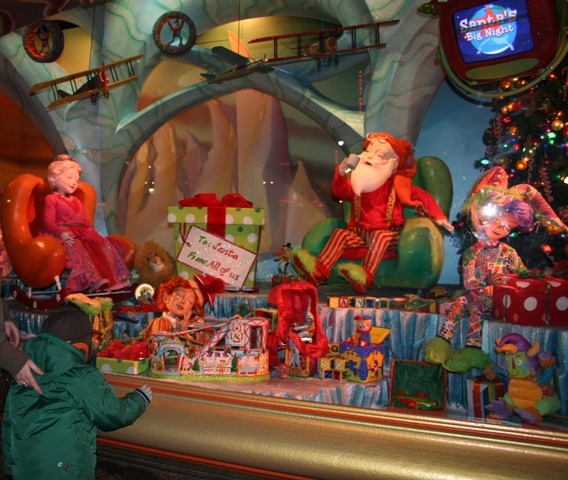 The Macy’s windows and FAO Schwartz were our favorites. So many happy memories! 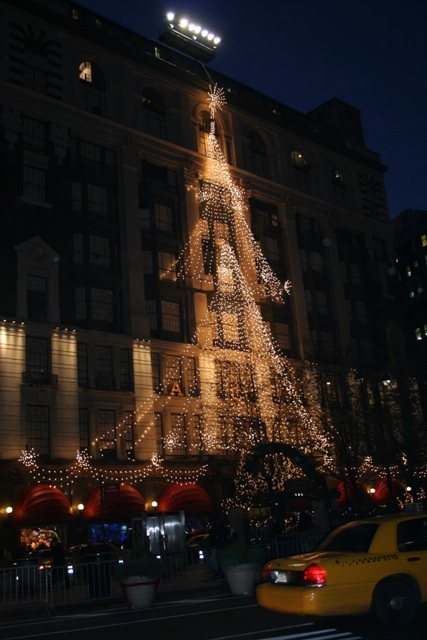 I’ve been to NYC several times but Christmas was definitely my favourite too. Those shop windows are incredible – sounds like you did just the right thing to avoid the crowds! !